LOL this one made me laugh Colin’s always naked!! he should put on some clothes once in a while, maybe just a scarf! This is a time for Colin’s favorite floral dungarees! i read all of the pages in here.. and i love it! Haha ! I agree with Spam Comment ! Bahahahaha xD I love it. Sounds like something a friend and I would talk about. The only difference is that if one of us starts yelling, we would apologize and the other would say, “All is forgive.” in a funny voice, then we would burst into a fit of laughter. Pauline and Colin should take up our, “All is forgive.” rule. It even works on friends that whine to much. Haha! 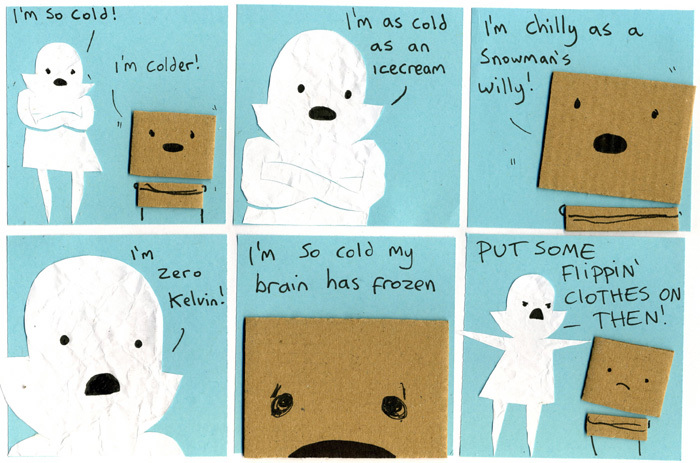 I love the snowman’s willy part! Yes, will Colin wear a cute little snow outfit next? Make it something really ridiculous and sweet, Colin would love that, I think! Haha! Love him! Being from Canada, I would love to see Colin in a very puffy parka or many layers of clothing that made him look incredibly ridiculous. btw these comics are AWESOME!!!!!!!!!!!!!!!!!!! !